This latest book by Lin Anderson is another in her Rhona MacLeod series and is first rate. Rhona is a highly skilled forensic expert and Anderson’s series brings her vividly to life. She is an intelligent, feisty female and it is a refreshing change to read a book that centres on a successful, professional woman who loves what she does. 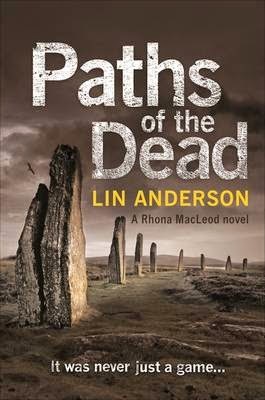 In this latest instalment, Rhona is called upon to examine the body of a young man that has been found inside a Neolithic stone circle near Glasgow. The body is face down and its hands have been removed which, according to Rhona, suggests some kind of ritual killing – reinforced by a stone inside the mouth, with the number 5 on it. DI MacNab, newly promoted and keen to prove himself, is of the opinion that the victim is part of the gangland drug scene but, when another body is found in another stone circle, he is forced to change his mind. PATHS OF THE DEAD sees Rhona working closely with several of the men in her life and it is interesting to observe the tensions between the men as they circle around her, vying for her attention and becoming a bit aggressive and jealous with each other. The way Rhona handles it all is superb. She keeps them all in their place and manages to continue to be professional, even when not all of the others are! As the body count increases, so MacNab is forced into realising that this killer may have something to do with his own past. He puts his promotion, as well as his life, on the line as he goes in search of the man responsible for all this death. Rhona is left wondering what he is up to and, as she puts the pieces of the puzzle together, is forced to witness something that could change her relationship with MacNab for ever. I love Lin Anderson’s series about Rhona MacLeod. It is always a delight to be asked to review another one of her books. PATHS OF THE DEAD is yet another fantastic tale. I am keener than ever to find out what happens next!